Social Action Project at the Song and Spirit Institute for Peace in Berkley (2599 Harvard, Berkley, MI) Join us as we cut fleece for hats for needy children and stuff paper bags with non-perishable food for the homeless. Contact Gail Katz if you would like to join us! gailkatz@comcast.net or 248-978-6664. See Flyer Below! Celebrate Women’s International Day with WISDOM, the National Council of Jewish Women and the Diversity Task Force at the Birmingham Community House, 380 South Bates Street, Birmingham, MI. See information below! The Dinner Party with Women of Note – an exciting event in the works for WISDOM women!! Stay Tuned! Please bring your collected spare change, the contents of your “change jars.” Our collecting and donating will help change the lives of other women. All event profits and donations will be given to NCJW’s Luggage for Freedom (our program with HAVEN) and SAFE (Sisters Acquiring Financial Empowerment). Many thanks to The Community House for generously donating their facilities and refreshments. To make your reservation with $10 registration fee, send a check to the office or call the NCJW office (248-355-3300, ext 0) to pay by credit card. Register and pay online at www.ncjwgds.org. Please register by Monday, March 2nd. Last week wasn’t my first Religious Diversity Journey. I’ve been writing and compiling the Interfaith Leadership Council newsletter since March of this year and one of the first events I attended was the Journey program at Dearborn’s Islamic Center of America (ICOA). Journeys is a program in which 7th grade students from middle schools around the community tour different houses of worship and learn about their faith traditions. I was delighted and impressed with the vision of the program, and with its execution. In a world where most kids seem glued to one kind of screen or another, immersed in what seems (to my jaded old eyes) to be mostly tripe, it was a pleasure to see a room full of seventh graders engaged in something that was meaningful and deeply important, and which they seemed to be enjoying. But last week’s journey was special for me, as it was the first one I took as a parent. Religious diversity is not new to my kids. A few months ago we spent a revelatory afternoon at the Muslim Unity Center, where our guide singlehandedly, by virtue of her openness, her hijab and her very Americanness, dispelled almost every stereo-type one might have of Muslim women. I entirely enjoyed watching my teenage daughter’s face brighten with enhanced perspective as she heard that our guide had been born and raised in the US, and had chosen as an adult to wear hijab. Far from experiencing it as confining and demeaning, she said she felt that it provided her the liberty to not worry about her hair, and respect from those who instantly identified her as a serious religious person, and not the type of object that billboard lingerie models, and girls that emulate them, become by exposing themselves. Like many religious communities, the Jewish community in which I grew up has a tendency towards exclusivity. I’ll admit that I grew up feeling discomfort rather than communal joy from the time the first Christmas lights went up and the carols started playing in the grocery stores to the blessed moment when the season ended and I could go back to the illusion that I was not a perennial outsider in a country I was uncomfortable regarding as my own. I grew up tolerating, but not accepting or understanding any other faith. But I was lucky to have been born with a curiosity that led me into conversations that expanded my worldview, blurring and eventually erasing the lines between me and “them.” My own interfaith journey began by accidentally learning the value of the kind of candid conversations that IFLC works to encourage through these journeys. During that first journey at the ICOA, I happened into the ladies’ rest room and was privy to a short exchange between one of the participants and a student from the Maya school, who had come in and taken off her hijab. The two young strangers stood in front of the mirror quite casually talking about their hair like any two middle-schoolers in any girls’ bathroom. And I resolved at that moment that my daughter Ruby, who was then a sixth grader at Abbott Middle School would participate in this year’s journey. I grew up in West Bloomfield, have driven by Kirk in the Hills too many times to count, and have marveled at it from the road, but never actually imagined going in. It was, after all, a church. When I heard that the Abbott RDJ participants were going there, I suddenly realized how very, very much I wanted to go into that magical looking place. It is a fit tribute to God almighty, in my opinion, every detail designed by its founder, Colonel Edwin George, to create a celebratory sacred space. I don’t know what the students did or did not learn on this journey. But the very feel of it, I believe, must have communicated to their hearts that it was created as a place to connect to that which is holy. On my own journey, I have learned that that place in our hearts, when we open it, is where we can all connect across the lines of differing theologies and rituals. At the end of each journey, children and parents are asked to recap what they’ve learned, and what the highlights were for them. Personally, I completely enjoyed hearing the story of Colonel George’s commitment to creating a house of worship in the middle of what was then nowhere, visiting the great cathedrals of Europe and eventually choosing the 12th century Melrose Abbey in Scotland for his model, that it took almost a decade from 1950 – 1959 to build, that he insisted that its iconic tower be built first, knowing that if money seemed tight, the church leaders would cut there first. The carillon in the tower is one of the largest in the world with 77 bells ranging from 14 pounds to a mind-boggling 6 tons. The church’s pipe organ has pipes reaching 32 feet and when you stand in the chancel while it is being played, the sound is like nothing I have ever experienced. Hoping that this is not heretical to someone, but if God had a throat and was singing and you could stand inside God’s throat, that’s what it might sound like. The other remarkable instrument in the church is the body of Glenn Miller, the church’s Music Director and organist, who told us, in his own unique basso profundo, about the church’s many choirs, from wee ones up to the professional choir that sings each Sunday morning. I learned about the structure of the service, and the governance of the church from Rev. Tres Adams, and, from Rev. Dr. Carol Tate,http://www.detroitinterfaithcouncil.com/local-interfaith-events the meaning of the colors used in the church during the different liturgical seasons. In a panel discussion, I learned that CJC-LDS Bishop and IFLC board member Greg Geiger can do an amazing recounting of the history of Christianity in less time than it takes a 7th grader’s mind to wander, and that both Rev. Tres Adams and IFLC board member Rev. Kenneth Flowers of Greater New Mount Moriah Missionary Baptist church have spent a lot of time coming up with great explanations of the trinity. I also learned, and this may have been the highlight for my daughter, that there’s a very cute boy that goes to one of the other participating schools. That is part of the journey. And finally, I learned that my daughter doesn’t seem to have inherited my childhood discomfort of all things Christmas. She posed for photos without hesitation in front of the Christmas tree, and seemed not the least discomfited by the intense and overt Christianness of the place. She just thought it was beautiful. So, maybe I’ve done my job, which was to start her on this path. Having experienced RDJ as a parent, I realize that we each have our own journey. And the parent’s journey is to have this experience side by side with our kids, as they enter it, not as children, but as burgeoning adults, each of us going into the sacred spaces in our community and the sacred space in our own hearts to discover whatever we discover there. Or maybe we’ll discover something truly useful and meaningful in the rest room. Who knows? What I do know is that this program creates these opportunities, for students and parents, by taking us on unique and wonderful journeys into these special holy places, and by connecting us to each other through our basic human reactions to their beauty and magnificence. Extremists for centuries have claimed religious reasons for their barbaric actions, creating a backlash against others who are truly following their beliefs. Today we are seeing that play out in Michigan, as members of our local Muslim community are facing hatred, harassment and vandalism in retribution for acts happening half a globe away – acts that they are quick to condemn themselves. Judging someone on the basis of their religious beliefs is just as unacceptable as judging them on the color of their skin, or their gender. Unfortunately, due largely to ignorance, we are seeing stereotyping playing out here in Michigan in the wake of the deplorable series of beheadings, terrorist attacks on schools, hostage taking and other uncivilized behavior in the Middle East, Pakistan and Australia. Our friends and neighbors of the Islamic faith are not responsible for the violence done in the name of religion around the world. We join in denouncing those who racialize and minimize Islam, blaming it for geopolitical tensions and using it as an excuse for more violence rather than developing a better understanding of Muslims and the Islamic religion. As we always have, we stand united with our Muslim sisters and brothers, especially during this time when their religion has been hijacked by extremists. Indeed, Muslim religious leaders from across the region spoke out against ISIS on Aug. 15, with Imam Mohammad Elahi, of the Islamic House of Wisdom, calling ISIS “a bunch of gangsters” that does not represent Islam. ■Arrange a visit to a Mosque by contacting the Michigan Muslim Community Council at www.mimuslimcouncil.com. ■Arrange a presentation on Islam by the Council of American Islamic Relations. More information available at www.cairmichigan.org. ■Join the Take on Hate Campaign. Learn more at www.takeonhate.org. ■Read the recent study by the Institute for Social Policy Understanding on Islamophobia available at http://www.ispu.org/islamophobia,which addresses the rise in fear and hate expressed toward Muslims in the U.S. The study also provides specific examples of successful collaboration to combat this fear, which is usually directed at other people of color, immigrants and women. In this holiday season that sees the world draw together, it is important for all to realize that peaceful American Muslims live and thrive in many Michigan communities. They are our neighbors, friends and co-workers, and contribute to the rich fabric of our communities and the strength of our economy. We cannot allow stereotyping and irrational fear to drive our actions against the vast majority of Muslims who reject the extremism of ISIS, and believe that loving practice of their religion can make our state and nation a better place. Steve Spreitzer, is president and CEO, Michigan Roundtable for Diversity and Inclusion; Kary Moss, is executive director, ACLU of Michigan; Matthew J. Wesaw, is director, Michigan Department of Civil Rights; Cary McGehee, is president, Michigan Coalition for Human Rights. Parwin Anwar in her kitchen with a tray of fresh bolani, a pan-fried turnover filled with a mix of vegetables. The taste of bolani helps them to remember their origins in Afghanistan. The new“Taste of Home” study guide, which is now part of the resource page for United America, connects the foods we eat with at least four of the 10 Core Values identified in the book. Yesterday, we looked at foods that remind us of freedom.Sometimes, foods recall a whole cluster of values. How difficult was this journey? “We had to leave everything behind. We couldn’t take anything or tell anyone we were leaving. We didn’t even say goodbye to our family,” Parwin Anwar told Bobbie Lewis. In a group of 17 that included an elderly couple, six teenagers and three children, they left Kabul and walked 150 miles to Pakistan. It was late July and very hot. No one in the group had good walking shoes. Everyone wore traditional clothing, complete with bangle bracelets and henna for the women. Their escape took place during the era of Soviet conflict in Afghanistan; Soviet bombardments were common in the region; the family could have been arrested at any time. So, they wore this style of clothing to match with their cover story: In case they were stopped at a checkpoint, they could claim they were going to a nearby village to attend a wedding. It is thought to be a one-of-a-kind: tucked away in a multicultural, working-class suburb of Bern stands a house with five sanctuaries, one per religion. The House of Religions is a place for coexistence and interaction. With the tip of his spatula, an artist perfects the round of the shoulder of Ganesh. The small god with the elephant head is seated on the knee of Shiva, one of the great Hindu deities. At the foot of the construction, another artist prepares mortar, the noise of his mixing machine drowning out the voice of a Tamil singer coming through the PA system. Further away, some altars are already decorated in bright colours, but the gopura, the large tower that marks the entrance to the temple, is still the monotone grey of concrete. The artists have come from Tamil Nadu especially to complete this work. “It was quite difficult to get visas for them. At each stage of the process we were being made to start the paperwork all over again,” says Sasikumar Tharmalinguam, the Hindu priest who will officiate at the House of Religions. “Difficult is putting it lightly,” says Brigitta Rotach, cultural director of the organisation. Today, however, the two are in a more relaxed mood. The culmination of an idea born nearly 15 years ago, the House of Religions will finally open to the public on December 14. Now it is time to forget the administrative hassles, have a party and meet new people. In the early 2000s, Rotach, a theologian of Jewish origin from Zurich, was the presenter of a German-language television show called “Sternstunde” (great moment). It was there that she met Hartmut Haas, a Moravian pastor (a branch of Protestantism) who today manages the association House of Religions – A Dialogue of Cultures. At the time, the fathers of the idea were well aware that such a place would not miraculously rise from the earth. But Haas was in no mood to wait for a building and started the association in his kitchen before finding a space in town. He called it the House of Religions and the communities started a restaurant, organised various activities such as language and integration courses, yoga and so on. The institution then moved into wooden huts, where the Hindus had a small temple and the Buddhists, the Alevis (derived from Shiite Islam) and the Moravians gathered to pray and meditate. It was a far cry from the new lodgings at Europaplatz. Here in a modern complex that also houses apartments and a shopping centre, the religions have a real foothold in the street. The section attributed to them has a large common room and a series of smaller rooms upstairs which will be used for joint activities. Surrounding these spaces over two levels are the places of worship for each of the five religions: Christian, Muslim, Hindu, Buddhist and Alevi. Why these religions and not others? This is where the local aspect of the project comes in, because if the House of Religions holds a potentially universally symbolic value, it is also very much anchored in the reality of life in Bern. Rabia Zahir is a Muslim woman who grew up in Pakistan. Roseanna Vogt is Catholic. Over spicy-smelling cups of tea in the basement of the Southern Maryland Islamic Center in Prince Frederick, the two are able to learn and find common ground through the Daughters of Abraham, a group that formed after Sept. 11, 2001, welcoming women from the three Abrahamic faiths: Islam, Judaism and Christianity.“I have learned so much from the dialogue we’ve had,” Vogt said. Zahir, of Hughesville, decorated the white concrete expanse of the basement room at the Islamic Center in Prince Frederick to give it a remarkably homelike feel, with green tablecloths covering the round tables topped with gold lanterns as centerpieces. A lime-scented candle is lit at the front of the room as about a dozen women of the three faiths snack on pizza, fruit and chocolate. Even though Zahir went to Catholic school in Pakistan, she found she had much to learn about the Christian faith, like how there are more types of Christians besides Catholics. “The group gave me an opportunity to get in touch with more people,” she said. Sally Douglass of Port Republic said she has been able to defend Islam because of the things she has learned from being a part of the group, even though she isn’t Muslim. The inception of the Daughters of Abraham came from a conversation in a van while a small group of people were returning from a conference in Washington, D.C., shortly after Sept. 11, 2001, said the Rev. Peter Daly, pastor of St. John Vianney Catholic Church in Prince Frederick. One of the challenges given to those attending the conference was to start a grass-roots movement for peace and understanding between faith groups. “There was so much division in our community at that time … in the nation,” Daly said in an interview. Since its inception, the group has visited the places of worship in Washington, D.C., for each faith, gone to the Holocaust Museum, participated in interfaith services and held meetings on various topics to discuss many aspects of the three faiths. During the October meeting of the Daughters of Abraham, the discussion ranged from Halloween celebrations, saints and the Ten Commandments to Jewish traditions and how they are carried on in the Christian faith and more. The group gathered was predominantly Christian, as 11 Christian women attended along with two Jewish women and Zahir, the sole Muslim. 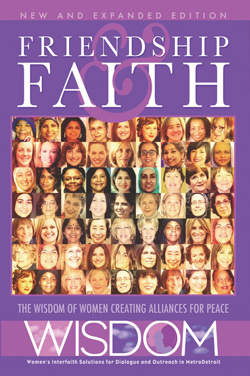 The women learned the Ten Commandments are a part of all three faiths. The story of Moses going to receive the Ten Commandments on stone tablets is included in the Quran, Torah and Christian Bible. “The Ten Commandments is very much a part of our faith,” Zahir said. Norma Imershein said Jewish households put containers called mezuzahs near the doors of their homes. The mezuzahs can be simple or elaborate and contain the text of the Ten Commandments. Douglass said she loves hearing how the Jewish faith carries on biblical traditions. Imershein said all the faiths apply Jewish traditions in different ways. For instance, she said, many Baptists don’t realize how the practice of baptizing people with water is derived from the Jewish practice of cleansing oneself with water before the Sabbath. For Halloween, Roberta Safer of Port Republic said the holiday is viewed negatively in Jewish tradition because, historically, bad things happen to Jews on Halloween. Additionally, orthodox Judaism prohibits its members from participating in what it deems idolatrous practices, including Halloween. Some Christians frown upon the celebration of Halloween, while others embrace it with roots to All Saints’ Day and All Souls’ Day. Group member Susan Mattingly told the women of how she used to teach in a Presbyterian church that forbade Halloween, so her class had to work creatively to be able to dress in costumes for that day by dressing up as things in their science unit. Although the faiths have their differences, they all trace back to one common patriarch: Abraham, and the belief in one God. At the end of the meeting, Zahir was asked to talk about the Arabic texts hanging on the walls of the Islamic Center. First, she read the texts in Arabic; her reading was more like singing or chanting rather than reciting. Then, she translated the passages to English. One of the passages Zahir said was one of the most important texts in the Quran. Safer said it resembled the Shema recited by Jews during prayer services and corresponds to Deuteronomy 6:4, which says, “Hear O Israel, the Lord our God is one Lord.” Zahir’s singing reminded Imershein of the way Jewish rabbis chant the Torah. “There is no God but him,” Zahir read. “The living, the eternal, he neither slumbers nor sleeps. To him belongs all that is in the heavens and the Earth …” Zahir read. “It sounded like it came out of the Torah,” Imershein said. The Imams Council of the Michigan Muslim Community Council deplores the actions of the misguided Muslims who in the name of our faith took the lives of 12 people. The terrorists stormed the Charilie Hedbo magazine offices yesterday killing journalists, including its founder, Charlie Hebdo, and its current editor-in-chief. Neither God, nor Muhammad, whom they thought are defending, nor the overwhelming majority of Muslims would sanction such a heinous crime. The perpetrators must be brought to justice and face the consequences of their crime against humanity. Cartoons that depict a Prophet to 1.5 billion Muslims as “terrorist” or an enemy is indeed offensive to all Muslims. However, Muslims need to be cognizant of the teachings of the Qur’an and Muhammad, the Prophet of Islam. We ask all people of conscience to not paint the entire Muslim people with the same brush. The Imams strongly urge peaceful dialogue with Muslim leaders. The whole world is grieved over those who lost their lives and so do the Imams. We ask all citizens to refrain from violence and promote peace. Neither war nor revenge work for peace. Dialogue is the only way to peace. On behalf of the Imams and the Muslim community we offer our condolences and deepest sympathy to the family of the victims as we pray for peace and a world free of hate and bigotry. The Imams’ Council of the Michigan Muslim Community Council represents a coalition of Muslim religious leaders (imams) in Southeast Michigan. MMCC and Islamic Relief-USA gave $100,000 to Detroit residents this week to help with the water crisis. Over 25,000 Detroit residents have had their water shut off since last year due to aggressive collection policies brought on by the Detroit bankruptcy. A check of $50,000 was given to both the Detroit Water Fund AND Wayne Metro Community Agency to help Detroit residents get water for their homes. This act of charity was inspired by our Islamic teachings and our desire to be a positive force in revitalizing Detroit. This has been widely covered by the media (Detroit News, Huffington, NPR, and more).Detroit’s water problems have been highlighted by the United Nations, the Daily Show and many others. Detroit has given so much to the Muslim community over the decades, we are compelled to help it recover. So many other great efforts are also underway, including the the Huda free medical and dental clinic; Zaman International; DREAM for Detroit, the Ramadan Fight Against Hunger, Muslim Family Services, Detroit Muslim Mission, and many more! Join these efforts now, be a part of the solution! Its Saturday night in Paris and a live band jams on stage, encouraging the audience to sing and dance along with their music. A quite ordinary scene, apart from tonight the lead singer is a Christian and his backing singers, two young men with their arms draped over each other’s shoulders, one of them is Muslim, and the other is Jewish. As for me, I am a British Quaker dancing in the middle of an Orthodox Christian from Romania and a Pagan from the Basque country. And I’m grateful for the diverse globalized world which gives me nights like this one. But that Saturday night in Paris took place at the start of last November. Since then, we have witnessed a very dark winter here in Europe. A steady rise in far-right nationalism and anti-immigrant sentiments has led to violent attacks on mosques in Sweden and anti-Islam marches across German cities, meanwhile reports suggest that Antisemitism in Europe is higher than it’s been in years. And now, in Paris, a horrific act of terrorism. In response to the Paris attacks, reports of grenades thrown at the city’s mosques demonstrate the level of anger some feel towards these events. And it is perfectly natural to feel angry when faced with a situation one cannot understand. Yet when in the history of human civilization has a violent response to violence, of hatred towards hatred, ever created a wholly positive result? I’m certainly not the first, nor will I be the last, to point out that the angry, hate-filled actions of terrorists and those of the far-right perpetuate the same response: division and deep mistrust. In a bitter-sweet and ironic turn the opposing actions of these two extremes continually add fuel to each other’s arguments. The good news is that these extremes remain very much in the minority. There are over 4.7 million Muslims in France but four men were involved in Wednesday’s attacks. And whilst a handful of French people have retaliated with violence towards Muslims, hundreds and thousands took to the streets of Paris and other European cities in a show of defiance; in a display of unity, togetherness, solidarity. Those who believe in finding a way to live together, side-by-side with our diversity, remain the majority. But we need to be a vocal majority; an active majority. Although we must also ensure that we are an inclusive, respectful majority, ready to explore our differences with mutual open-mindedness. My personal response to the rise of extremism — of all types — across Europe is to continue to try and build bridges of understanding between different religious and non-religious communities; to find a way for each person to recognize our shared humanity, as first and beyond the other labels we take on and are given. The evening of music I describe above was the finale to the last interfaith conference I was involved in, and it took place in central Paris. There I met and worked with an incredible group of young French activists from the organization Coexister which works to create dialogue and foster solidarity between young people from different faith backgrounds. They are truly an inspiring group, working in a hostile environment and achieving incredible results. The problem of extremism, I would argue, will never be solved by delegations of senior politicians at high profile conferences. Rather it is through the grassroots work of organizations like Coexister that individuals, communities and society will slowly be changed. But the interfaith movement in Europe sadly represents a rather small, under-resourced and critically under-funded group; non-the-less, a group with big ambitions. As one of a team of young leaders working alongside the United Religions Initiative (URI) in Europe, I’m helping to create a project which aims to develop and grow the interfaith movement by supporting other young activists in building their skills and resources, assisting them to become effective leaders who can make a positive impact in their communities and beyond. Given the news headlines week-in, week-out, interfaith and intercultural relations ought surely to be a priority. Yet we struggle to find funding and support. A positive response to Paris would be to support organizations like Coexister and URI any way that you can. To join the interfaith movement — which in spite of its slightly problematic name, is usually welcoming to people from non-religious, humanist and atheist backgrounds — as a volunteer and an activist. To join and start-up appreciative dialogues on how we might best approach diversity in our contemporary societies. And most of all, share your good news stories of people from different religious and cultural backgrounds working together, having fun together, making music and dancing together, of interfaith friendship, love and solidarity. For these are the stories of a reality which extremism seeks to deny. Boldly creating and sharing these stories is surely the greatest response to hatred.